A few days ago, I was informed that The Battle of Peach Tree Creek: Hood's First Sortie, July 20, 1864 has arrived at the publisher's warehouse and will ship next week. This is the first major title on my 2014 radar and I'm looking forward to reading it. Author Robert Jenkins's name sounds familiar, like I read an article or essay by him at some point, but I can't place him with any previous publications. 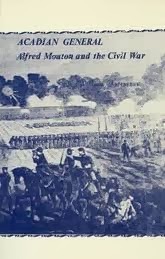 "Acadian General: Alfred Mouton and the Civil War"
I spend so much time reading and reviewing new releases that I rarely have time to revisit books from the home library purchased years ago but never read. Earlier this month, I finally unwrapped William Arceneaux's Acadian General: Alfred Mouton and the Civil War (Center for Louisiana Studies, 1981 2nd revised & expanded ed.). I picked it up at a special sale from the publisher, in reckless disregard of my favorite Louisiana Civil War consultant's sage advice to not bother with it. It turns out I probably should have listened. It's not that it's a terrible book, just dated past being particularly useful. A member of a distinguished and politically prominent Louisiana family (his father was a governor), Jean-Jacques Alexandre Alfred Mouton was one of those West Point graduates that immediately resigned to seek greener pastures but returned to military service with the outbreak of the Civil War. Elected colonel of the 18th Louisiana, Mouton was wounded at Shiloh. Returning to West Louisiana with increasing levels of rank and responsibility, he fought in many battles and skirmishes in the Lafourche district, Bayou Teche region, and Red River (where he was killed at Mansfield). Acadian General describes at some length the travails of the Acadian people of North American and how they established themselves in Louisiana after their expulsion from British Canada. While the family history and section describing Mouton's antebellum life and career is helpful, the book doesn't really enhance our understanding of the military events chronicled inside, but, to be fair, when the first edition was published in 1972 (I believe) the material would have seemed far fresher than today. Still, as the reader, it's a very limiting experience to read an officer's military biography with no private commentary or campaign perspective from the man himself. The 2nd edition does add a roster of the 18th (just a list of names), a copy of Mouton's academic marks at West Point, some poetry, and a bibliographical essay. If memory serves, B&G typically reserves their yearly Gettysburg special issue for the middle months, but they're switching things up in 2014 and the next one up [Vol. 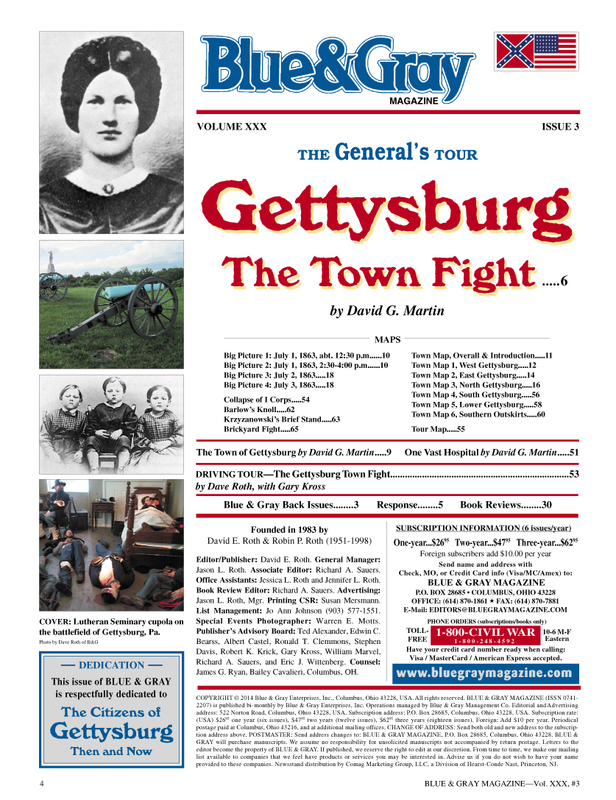 30, Issue #3] this winter will cover the Gettysburg street fighting. David Martin is the author. The first of the 2014 titles are in, and they're a pair of doozies. 1. 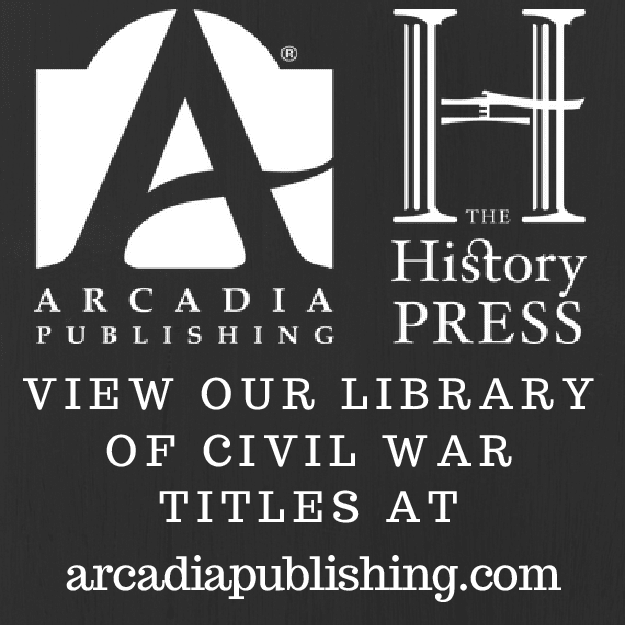 Guerrilla Warfare in Civil War Missouri, Volume III, January - August 1864 by Bruce Nichols (McFarland, 2014). Bruce Nichols is an indefatigable researcher and his ongoing multi-volume (currently at 3 of 4) Guerrilla Warfare in Civil War Missouri is one of those landmark publishing projects that fly a bit under the radar. The breadth of evidence gathering and coverage, digging into every corner of the Show Me State, is awe inspiring to the degree of worrying for the author's sanity. The end is finally near, with only the indexing of the fourth and final volume remaining to complete. This book takes the reader through the penultimate year's uptick in violence in anticipation of the expected Confederate invasion, what would be known as the Price Raid. 2. The Pennsylvania Reserves in the Civil War: A Comprehensive History by Uzal W. Ent (McFarland, 2014). Like the above work from the same publisher, this encyclopedic unit history is another massive piece of scholarship, boasting over 400 8 1/2 x 11 sized, small print pages augmented by a flurry of maps, drawings, photos, and organizational tables. "This history chronicles the division’s service from its organization in May 1861 through June 1864 [among other places, fighting at Mechanicsville, Frayser's Farm, Second Bull Run, Fredericksburg, Gettysburg, the Wilderness, Spotsylvania Court House, and Cloyd's Mountain], when most of its soldiers reached the end of their service commitment. Short biographical sketches, most accompanied by photographs, introduce the Reserves leadership. Throughout, excerpts from letters, journals, diaries, and books from more than 150 members of the Reserves provide a personal perspective on the action and reveal the human side of battle." I've said it before, but this has been an unusual winter. It's the constant arrival of new and interesting titles in the mail that buttresses the morale of the unpaid reviewer, but this season's paucity of Dec. - Feb. releases has not been saved by the usual flood of fall titles that missed their original dates. These all seem to have skipped ahead to spring and beyond. Sigh. If things don't pick up around here you'll start seeing posts like "Who's Hotter: Sarah Morgan vs. Kate Chase" and no one wants to read that. On the other hand, it leaves me with more time to work on my battle sim mobile app conversions. More on that later. Hilderman: "THEOPHILUS HUNTER HOLMES: A North Carolina General in the Civil War"
Latter day appreciation of Civil War generals typically centers on either their battlefield genius or administrative talent (rarely both), the latter encompassing a broad range of useful wartime skills such as political acumen, recruitment, subordinate talent recognition, and civil/military organization. 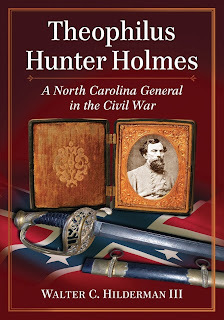 Few knowledgeable persons will be willing to defend the generalship of Confederate Lieutenant General Theophilus Holmes, but author Walter Hilderman, in his new book Theophilus Hunter Holmes: A North Carolina General in the Civil War, argues that the high ranking Tarheel officer's leadership role in maximizing state manpower mobilization during 1864-65 makes his service deserving of greater recognition. According to the author, Holmes left behind little in the way of personal papers and no postwar writings (though several manuscript collections located in Virginia and North Carolina archives are listed in the bibliography), making the task of the biographer difficult. In typical Civil War military biography fashion, Hilderman begins his study with Holmes's West Point years, moving from there to the young officer's early professional career, which was comprised of involvement in the Indian Removal affairs of the 1830s and fighting in the Seminole and Mexican-American wars. These sections do not provide a great deal in the way of details specific to Holmes, but rather more of a general discussion of events. In what fashion these earlier conflicts might have informed Holmes's Civil War service is not a source of serious speculation. Significant new information related to Holmes's Virginia, North Carolina, and Arkansas commands is not apparent. Contemporary allegations that Holmes was tardy in moving toward Manassas, missing the 1861 battle, remain without foundation. The conventional criticisms surrounding the general's performance during the Seven Days have softened over time, and Hilderman finds himself in accordance with the view that poor army-level staff work and situational confusion emanating from the top were arguably more responsible for Holmes's perceived timidity on June 30 than the aging general's mental and physical limitations. His command grade was certainly no worse than any of a number of others with similar levels of responsibility on that day, or the next. Holmes's infamous deafness is not a source of additional inquiry in the book beyond the author's finding that no primary source exists for the "I thought I heard firing" quote so often repeated in the literature in mocking fashion. The chapters related to Holmes's department and district level leadership in the Trans-Mississippi during 1862-63, including his direction of the disastrous July 1863 assault on Helena, Arkansas, are conventional in content and analysis. Hilderman's discussion of Holmes's unpopular time in Arkansas (mostly as a desk general) is not especially supportive of his study's thesis that Holmes rendered valuable administrative service to the Confederacy. Rather it is in North Carolina where this view is best reinforced. During the final twelve months of the war, Holmes was tasked with raising and organizing new state reserve forces. The intention behind such further robbing from the cradle and the grave was to use these formations to release regular Confederate garrison troops in North Carolina for more active service in Virginia, where they were direly needed. Hilderman, the author of a 2006 study of conscription in North Carolina, is well suited to document this aspect of the state's Civil War history, and it is indeed the best part of the book. With limited resources, Holmes was able to both enforce Confederate conscription in the state and mobilize Junior and Senior Reserve regiments numbering around 10,000 older men and boys. Their efficiency was mixed, but, given the inherent limitations, more could hardly be expected. Recognizing the talents of subordinates, mentoring them, and actively promoting their career advancement is an important part of the job of high ranking military officers, and its clear from Hilderman's biography that Holmes took this responsibility seriously. Members of his staff, most notably James Deshler, became generals and Holmes repeatedly reminded Richmond authorities of the work of other talented individuals like Major Peter Mallett, who served under Holmes at Aquia Creek in 1861 and later successfully managed an entire network of conscription offices in North Carolina. An important benefit of Hilderman's study is that it should disabuse readers of the popular notion that Holmes was senile and devoid of any useful attributes. 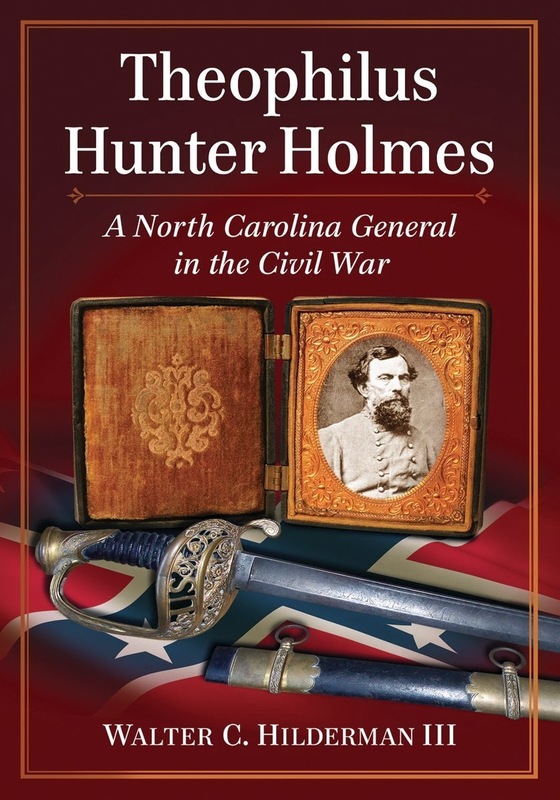 No one will take from Hilderman's biography a belief that Theophilus Holmes was a misunderstood gem of a Confederate general, but the book does provide the most fair minded assessment of the general's career yet published. Scholars of Confederate conscription will also find this study to be a useful tool. 1. The Fifth New York Cavalry in the Civil War by Vincent L. Burns (McFarland, 2013). This regimental history describes the New Yorkers's "experiences in the Shenandoah campaign of 1862, the epic encounter at Gettysburg, life in camp and on picket duty, the Wilderness in the spring of 1864 and again the Shenandoah in the fall of 1864". As bibliographical depth goes, it has the fairly typical appearance of those from unit histories and biographies from this publisher. 2. Living a Big War in a Small Place: Spartanburg, South Carolina, during the Confederacy by Philip N Racine (Univ of South Carolina Pr, 2013). This is a brief community-at-war history monograph of the type we're seeing more and more of these days. Emphasis is on "personal stories: the plight of a slave; the struggles of a war widow managing her husband's farm, ten slaves, and seven children; and the trauma of a lowcountry refugee's having to forfeit a wealthy, aristocratic way of life and being thrust into relative poverty and an alien social world". 3. Challenges on the Emmaus Road: Episcopal Bishops Confront Slavery, Civil War, and Emancipation by T. Felder Dorn (Univ of South Carolina Pr, 2013). I am unfamiliar with this particular specialized corner of the Civil War literature beyond a general awareness that Christian intra-denominational sectional divides existed alongside the secular ones and for many of the same reasons. Dorn "focuses on the way Northern and Southern Episcopal bishops confronted and responded to the issues and events of their turbulent times" and "carefully summarizes the debates within the church and in secular society surrounding the important topics of the era. In doing so, he lays the groundwork for his own interpretations of church history and also provides authentic data for other church scholars to investigate such topics as faith and doctrine, evangelism, and the administrative history of one of the most important institutions in America". From the university presses. A few still don't have catalogs available. * Notes From a Colored Girl: The Civil War Pocket Diaries of Emilie Frances Davis edited by Karsonya Wise Whitehead. * The Civil War as Global Conflict: Transnational Meanings of the American Civil War edited by David T. Gleeson and Simon Lewis. * The Collapse of Price’s Raid: The Beginning of the End in Civil War Missouri by Mark Lause. * I Do Wish This Cruel War Was Over: First-Person Accounts of Civil War Arkansas from the Arkansas Historical Quarterly edited by Mark Christ and Patrick Williams. * From These Honored Dead: Historical Archaeology of the American Civil War edited by Clarence R. Geier, Douglas D. Scott, and Lawrence E. Babits. * Uncommonly Savage: Civil War and Remembrance in Spain and the United States by Paul D. Escott. * America’s Corporal: James Tanner in War and Peace by James Marten. 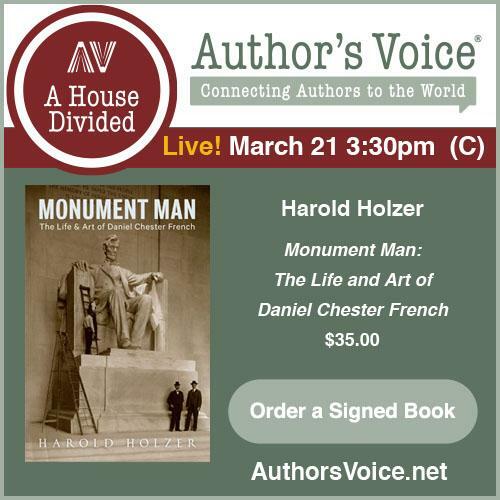 * Treasures of the Abraham Lincoln Presidential Library by Glenna R. Schroeder-Lein. * Abraham Lincoln, Philosopher Statesman by Joseph R. Fornieri. * Lincoln's Campaign Biographies by Thomas A. Horrocks. * We Called Him Rabbi Abraham: Lincoln and American Jewry, a Documentary History by Gary Phillip Zola. * Lincoln and Religion by Ferenc Morton Szasz and Margaret Connell Szasz. Warde: "WHEN THE WOLF CAME: The Civil War and the Indian Territory"
Prospective students of the Civil War in the Indian Territory (a vast area roughly bounded by Oklahoma's present state borders) will not find the kind of well established secondary literature common to other areas of study. There isn't even a truly good survey history available. Though all were published by reputable presses, Annie Abel's classic early twentieth century trilogy is a bit dated at this point and more recent volumes by Wilfred Knight and Lary & Donald Rampp are both unsatisfactory. 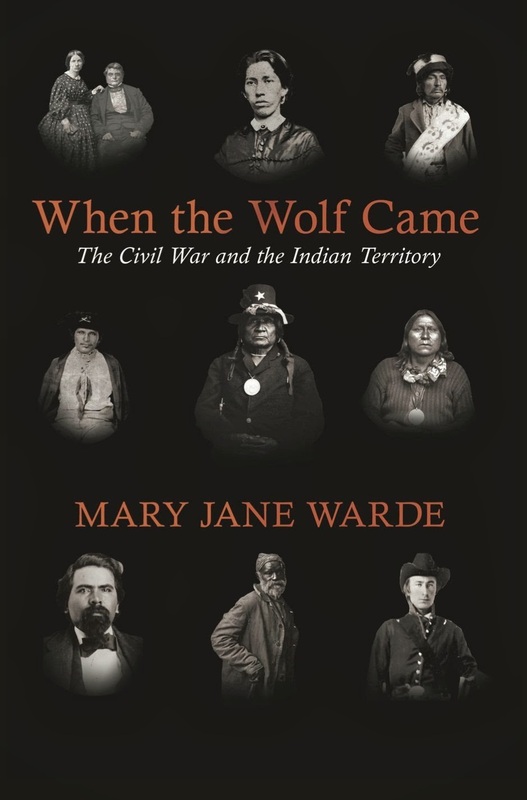 The need for a broad introductory volume of scholarly merit has never been greater and Mary Jane Warde's When the Wolf Came: The Civil War and the Indian Territory is a notable improvement. Beginning her examination long before the beginning of the Civil War years and ending it decades after the final surrender, Warde scrutinizes the subject through a wide lens. Centering her narrative on the so-called Five Civilized Tribes (the Cherokee, Chickasaw, Choctaw, Muscogee/Creek, and Seminole peoples), the author chronicles antebellum threats from within, mainly over removal treaties, and from without. Forcing the tribes to choose sides in what often seemed like a lose-lose situation, the American Civil War created new internal schisms as well as exacerbated the old feuds spawned by the violent removal debates. The large amount of space devoted to the above pays dividends later on, helping readers to better understand how the Civil War between North and South also became a intra- and inter-tribal Civil War, one that spilled over from Indian Territory into neighboring Texas, Arkansas, Missouri, and Kansas. A lengthy section at the end of the book charts the slow, decades long erosion of tribal sovereignty and resource control in Indian Territory, the associated influx of white settlement and economic development culminating in the creation of the state of Oklahoma in 1907. Warde does an able job of rendering these complicated events into digestible form. She also gamely attempts to quantify the human and material losses incurred by the tribes during the war, while additionally demonstrating how little loyalty to the Union shielded tribes from postwar land dispossession. Much of the book's middle space traces military events, with all the significant campaigns and battles at least briefly recounted. These include the flight of the pro-Union Creek faction under Opothleyahola to Kansas in 1861, Confederate Indian participation at Pea Ridge, and the Union army's 1862 Indian Expeditions. Back and forth skirmishes and raids continued over the next two years. The book duly notes these smaller scale happenings and also provides brief accounts of the battles of First and Second Cabin Creek, Honey Springs, and Middle Boggy among others. A great deal of ground is covered in all this and details limited, but the overall record is a comprehensive one. However, one wishes more light had been shed on the guerrilla warfare aspects of the fighting in Indian Territory, as distinct from the more formalized aspects of the irregular conflict. The impression is given that large areas were rife with bushwhacking on a scale similar to that experienced in Missouri, but Warde does not specify any individual leaders or groups involved. More maps also would have helped guide the reader over Indian Territory's vast unfamiliar ground. The two area maps commissioned for the book offer only a general sense of place. Recognizing that existing histories do little to address the western half of Indian Territory in any substantive manner, Warde goes some way toward integrating the 1864-65 plains conflicts with those associated with the Five Tribes. Confederates hoped to exploit existing tribal relationships to forge new ties with the Cheyenne, Arapaho, Kiowa, Comanche, and Plains Apaches enraged by U.S. western expansion in general and Sand Creek in particular. On the other side, Union authorities sought to subdue the plains tribes and confine them eventually to reservations in the western reaches of Indian Territory. In conducting her primary source research, Warde mined federal records and Oklahoma archives. The author is a proponent of oral history, quoting extensively from tribal and slave narratives recorded in 1930s interviews. The value of these is controversial for obvious reasons. Warde uses them with the recognition that the memories of old men and women going back to when they were small children can be very unreliable, but, as they are the only sources available in many instances, she deems them worthy of at least judicious consideration. In addition to a formal bibliography, Warde also includes a bibliographical essay, one that's pretty comprehensive if rather thin in critical commentary. With general history projects as ambitiously broad in scope as this one, synthetic elements necessarily abound. Unfortunately, as mentioned before, the secondary literature for the Indian Territory is one of the more underdeveloped in the Civil War literature. This lack of solidly dependable antecedents can lead to problems when overly relied upon, and some sections lean too much on secondary sources. As an example, rather than critically evaluating the work of previous scholars and writers, the book's account of Middle Boggy essentially parrots that of one of its source articles, even to the point of providing the same erroneous date for the battle. A cursory look into the relevant sections of the O.R. (it took me only seconds online) supplies the correct information. It's flaws aren't devastating, though. With its unprecedentedly full ranging and capable integration of the economic, military, political, and social aspects of the Indian Territory inhabitants's collective Civil War experiences, When the Wolf Came can be comfortably regarded as the best subject overview to date. 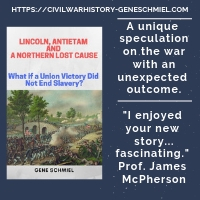 As with most books of this type, specialists will find large blocks of familiar content and can quibble with details, but new readers and those with a more diffuse interest in the Civil War in the Trans-Mississippi West finally have a useful general treatment at their disposal. It may not be an ideally realized update, but it is a forward step in the right direction and highly recommended reading. The Civil War Round Table of Chicago awarded 2013's Nevins-Freeman Award to Lawrence Lee Hewitt. Congratulations, Larry! There's even a youtube video of the ceremony. The group "bestows it annually on an individual whose advancement of American Civil War scholarship and support for the Round Table movement warrant special recognition. The award itself is designed as a generous financial donation to a historical preservation project chosen by the recipient".